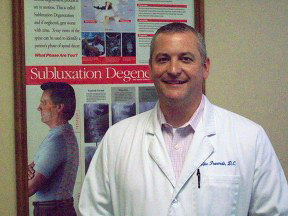 Dr. Mike Fruendt attended Northwest University, University of North Alabama, and Life University in Marietta, Georgia. He and his wife Becky have lived in the Huntsville community for many years and attend Farley Community Church. Dr. Fruendt belongs to Business Network International (BNI), and continues his education by regularly participating in chiropractic conferences throughout the Southeast. Health First Chiropractic is a regular participant at local health fairs, teaching people about health and chiropractic. Health First has a bi-annual Patient Appreciation Day, where, for the price of two canned goods items, patients get free food and a free adjustment. The canned goods go to local charitable organizations, such as the Food Pantry at Hillwood Baptist Church and the Rose of Shannon, to help feed the hungry in our community. Dr. Fruendt believes that health and wellness are the natural birthright of every human and we all have a responsibility to ourselves and our community to help maintain our health. Your body knows what to do – it’s up to you to give it the right tools for a lifetime of health and wellness!